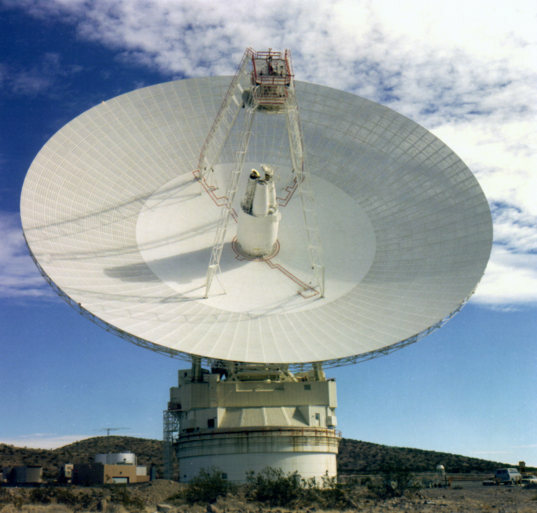 The Jet Propulsion Laboratory announced yesterday that the venerable 70-meter dish at the Goldstone Deep Space Network station is being taken offline so that major surgery can be performed. Part of its "hydrostatic bearing assembly," which allows the enormous dish to rotate horizontally, is being replaced, for the first time since the antenna was built. They say the replacement has a design lifetime of 20 years, which, based on past experience at the DSN, means it'll probably be in service for at least 40 more. Elevation bearings are also being replaced. The price tag for this important repair is a laughably low 1.25 million dollars. Are you kidding me? Consider the value of the data that squeezes through this dish! Front view of the 70-meter dish, also known as DSS-14, at the Deep Space Communications Complex at Goldstone, California. It's very good news that this much-needed maintenance has begun, but it's going to place a very heavy burden on the other two 70-meter dishes in Canberra and Madrid. The press release states that "The network will still be able to provide full coverage for deep space missions by maximizing use of the two other 70-meter antennas at Deep Space complexes near Madrid, Spain and Canberra, Australia, and arraying several smaller 34-meter antennas together." I just wrote a couple of weeks ago about ground being broken for new 34-meter dishes in Canberra, but of course those new dishes aren't ready yet. I always hope for smooth sailing for all space missions. But especially now, when we will for several months lack the irreplaceable sensitivity of the 70-meter dish for the slice of longitude that covers the Americas and eastern Pacific, I really really hope that there are no major anomalies on in-flight missions between now and November. With the 70-meter dishes so oversubscribed, anything unplanned will almost certainly mean some data lost from deep-space missions.